The club switched the nines again in 1934, between the first tournament and the second. This time, the reason was that the shady area near the current twelfth green, which lay at the lowest elevation on the property, was the last part of the course to thaw on frosty mornings. By playing the other nine first, golfers could tee off earlier. The new arrangement also made for more stirring Masters finishes, a fact that was recognized at the time. Tenth hole, Augusta National. Looking back up the hill, toward the tee. It’s easy to understand why MacKenzie thought of the current tenth as a good starting hole. The view from the tee is one of the most enticing in golf—the sort that can coax a smooth swing from a hurried player who hasn’t had time to loosen up. The drop in elevation to the ideal landing area is more than a hundred feet—enough to make a thinly struck drive seem solidly launched. The fairway runs down and to the left and out of sight, through a bending corridor of pine trees. The slope rewards any player who can work the ball from right to left, yet there is room on the right for those who can’t. Golfers leave the tee feeling that they are descending into a different world—an appropriate emotion for players entering the most celebrated second nine in golf. Early Augusta members playing the tenth. In MacKenzie’s first drawing of the hole, there was a big fairway bunker not too far from the foreground of this photo. (See the plan at the top of this post.) When this hole became the opening hole, though, he removed the bunker, because he didn’t think a golfer should have to clear a large hazard with his first shot of the day. But when the ordering of the holes changed again the fairway bunker wasn’t put back. The original tenth green, on the right. The modern green is on the rise well beyond it and to the left. Moving the green was the idea of Perry Maxwell, who one year later also redesigned the seventh hole. Maxwell pointed out that moving the tenth green to higher ground would not only solve a drainage problem but also markedly strengthen the hole. The change turned a breathtaking but mediocre short hole into one of the greatest par 4s in the world. 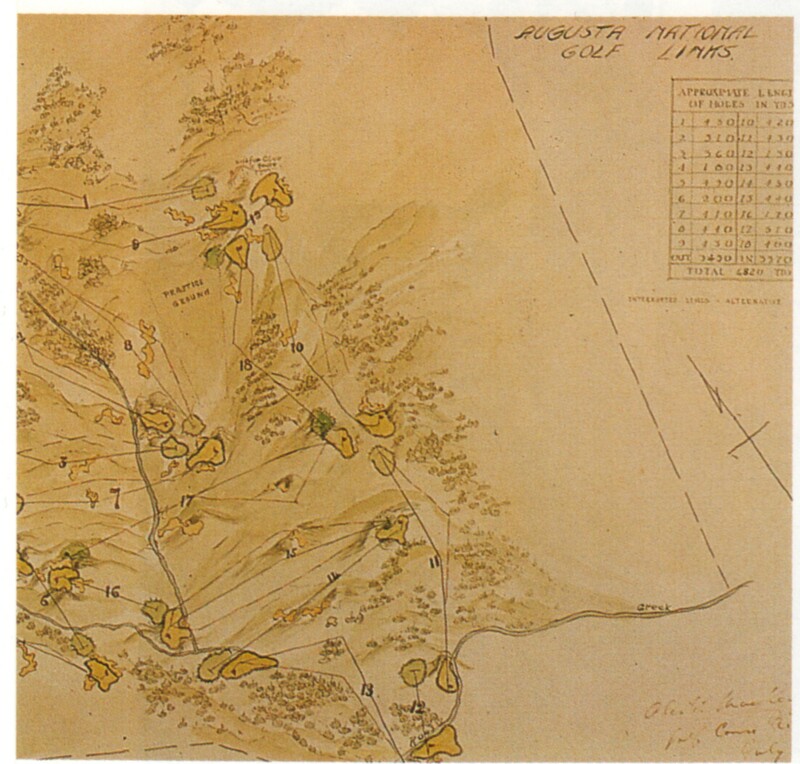 This entry was posted in Architects, Masters, Masters Countdown, Tournaments and tagged Alister MacKenzie, Augusta National, Bobby Jones, Clifford Roberts, Perry Maxwell by David Owen. Bookmark the permalink. Shame about the removal of the Eisenhower Tree. Pretty sure they’ve got something up their sleeve. Thats interesting, had not thought of that. 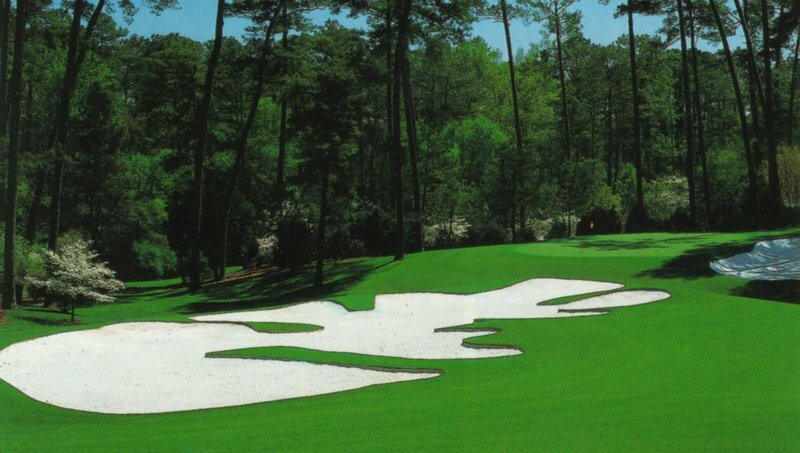 Do you know the last time a ball was hit into the MacKenzie bunker in the Masters? Good question. I don’t. MacKenzie did like hazards that looked scary but were easy to avoid if you didn’t panic, although the fairway bunker on ten doesn’t really qualify. It’s probably more of a decoration than an obstacle–except for members, of course, who do find their way into it. I attended the Masters on Saturday last year, my first time at Augusta. I spent a good bit of time along the tenth, admiring the cabins, and was very struck by the elevation change that you describe. The other thing that awed me on the tenth was how all the players I saw hit, not driver, but fairway woods off the tee. All absolute rockets that with few exceptions careened down the hill right to left and allowed them short irons in. Now I know how to play it! My husband has an old grammatical plan of the augusta National golf links, dated 1931, by Alister Mackenzie. Is yours a picture, a lithograph or how many of this are there out there?